Teams is Microsoft’s Swiss Army knife to accelerate digital transformation and to facilitate collaboration in distributed mid- and large-scale organizations. Microsoft Teams fosters group conversations and collaboration on Office documents and wiki pages, integrates file sharing based on SharePoint and offers one-on-one communication. With these capabilities, Microsoft Teams will be one of the tools we use every day and change the way we communicate and work together. But Microsoft leaves Office 365 users with one serious shortcoming: there is no unified search available across the many different Office 365 sources which encompass SharePoint Online, Exchange, Teams, Yammer, OneDrive for Business, and user profiles in Azure AD. 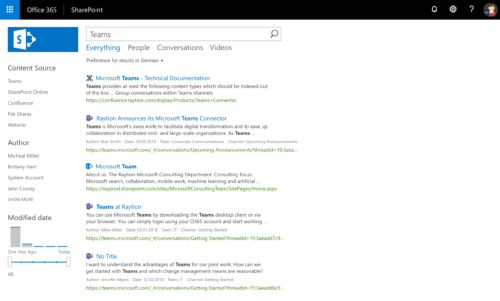 Raytion’s Microsoft Teams Connector closes this gap and indexes Teams conversations and their documents into a single unified search index. This enables you to implement state-of-the-art business apps, to realize e-discovery solutions or simply to enrich your already existing enterprise search solution with all relevant content from Office 365 including Microsoft Teams. Many companies use Microsoft Teams not only for team communication, but as one of their essential communication channels, be it for general news articles, for IT announcements or for the IT Help Desk. Then, Teams quickly becomes one of the critical knowledge bases for up-to-date information and decision support. The Raytion Microsoft Teams Connector indexes the conversations, shared files and wikis from Microsoft Teams into your enterprise search solution. This makes the previously siloed data searchable for everyone while item-level security is honored. When seaching, every user will see only results she or he is allowed to see. The connector offers smart processing of Teams content. Information can be enriched with related context and Teams conversations can be structured and categorized, which enables the building of rich business apps that solve valuable use cases. By including content from Microsoft Teams into a search solution, users can not only find information from Teams easily but will now see it in context side-by-side with relevant content from other information systems. Having Teams conversations available in the search index makes it possible to display the most recent conversations of a topic channel in the relevant places of your intranet portal and in other collaboration spaces. The resulting contextual and up-to-date intranet user experience turns your intranet into the starting point for seamless collaboration. Due to Microsoft’s new approach with Teams to internal and external collaboration, communication shifts away from its focus on e-mail. Internal, corporate communication follows the pattern we have seen on the Internet where e-mail gives way to instant, real-time communication. But new questions with regards to compliance arise. 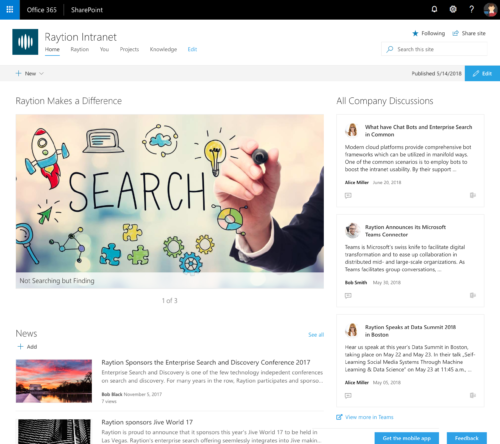 With the connector for Microsoft Teams, Raytion also serves e-discovery scenarios by making this communication channel searchable in real-time and allowing for monitoring it. The connector for Microsoft Teams can be combined with any other connector, e.g. for Microsoft Exchange, SharePoint or OneDrive for Business, and share the way how content is analyzed, processed and acted on. Curious? Interested? Then contact us.